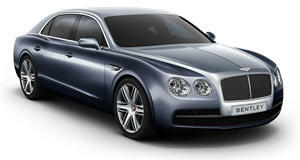 The Bentley Continental is a popular choice for those who are newly into money. After a while, we've also become a little restless over the sight of excessive Bentley Continentals. That's why the luxury automaker decided to add a little extra touch of individuality, the Series 51. The Series 51 is already available on the Continental GT coupe and Continental GTC convertible, and now it can be ordered on the Continental Flying Spur sedan too. The choice trim level gives customers a broader range of color options, including two-tone exteriors, three-tone interiors, special veneer choices, and some new rims. Individualism is highly coveted with this car, that's why there are over 14 special color combinations available for your choosing. Along with the Series 51, Bentley has announced new front-fender air vents for any Flying Spur, as well as blue brake calipers and the integration of a new touch screen infotainment system.